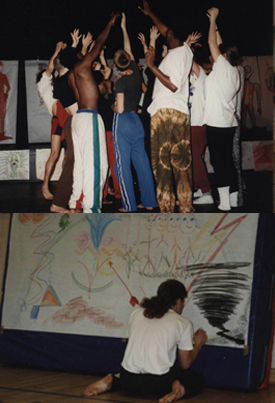 At a time when life holds great promise between childhood and adult life, through the power of art, Rehearsal for Change™ offers participants opportunities to gain an understanding of themselves while developing a strong self-awareness, raised aspiration and self-confidence to navigate life’s transitions, creating bridges to what matters deeply to make their world a better place to turn their dreams into reality. By tapping internal resources Rehearsal for Change™ is an interdisciplinary approach to learning which offers a framework to express what is felt but has no words while discovering solutions to collective challenges, to empower young people age 15-25 toward positive self-direction. In a safe, structured and caring environment Rehearsal for Change™ employs a variety of creative activities which reflect the perspective of person-centred learning while educating the whole person, there is something for everyone to harness and realise their potential to improve their relationship with themselves and others while learning through shared experiences. Our buddying support ensures that participants have the support they need. Courses are delivered by highly skilled and experienced professional trainers and practising artists who bring the programme to life with their current experience and knowledge. Joining is by completing an application form. For applicants under age 18 a signed consent from by an adult is necessary – parent or carer. For more information and an application form or if you have any questions please use the contact form below.